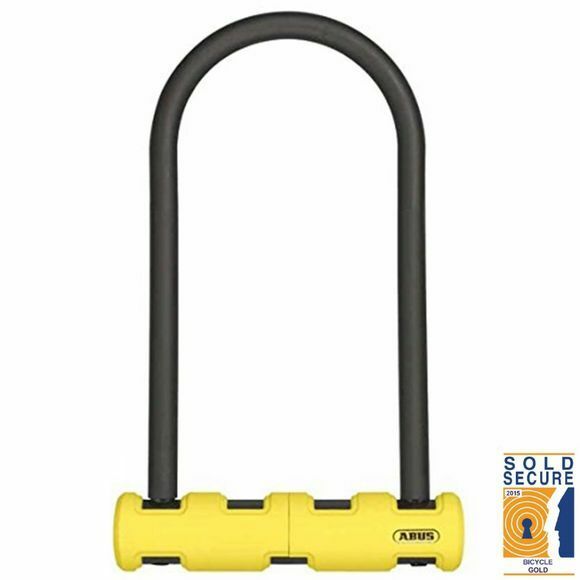 The Abus 430 170HB Ultimate D-Lock 230mm is a Sold Secure Gold rated lock. The Super Ultimate is urban level security in a high-tech minimalist design. The Super Ultimate uses a 14mm temper hardened steel round shackle. The shackle extends completely through the lock body providing even greater protection against torsion/twisting attacks and the shackle double bolts in the lock body. The Super Ultimate features an innovative soft touch cover that protects your frame and, like all ABUS locks, feature industry-leading corrosion resistance. The bright yellow lock body gives it a visible and distinctive look.